← Have connectionist models killed off beliefs? Alzheimer’s disease is the most common form of dementia and can occur sporadically in old age or less frequently can occur as Early Onset Alzheimer’s due to inherited genetic mutations. Individuals with Down’s Syndrome are at very high risk of developing Alzheimer’s Disease. Key symptoms of Alzheimer’s Disease are progressive memory loss, changes in mood and issues with communication. Currently, there is no cure for Alzheimer’s disease and it is estimated that 35.6 million people worldwide are affected by dementia (http://www.alz.co.uk/research/statistics). Alzheimer’s Disease provides great burdens on the health care system, is distressing for affected individuals and is very upsetting for family members caring for an individual with Alzherimer’s Disease. Research towards finding better treatments to halt disease progression and maybe even prevent Alzheimer’s is ongoing throughout the world. When I was an undergraduate, I was lucky enough to spend a year researching genetic risk factors associated with Late Onset Alzheimer’s Disease, which sparked my interest in learning more about this debilitating and progressive disease. Although I no longer work in the field, I try to keep up with new developments. A new step in Alzheimer’s Disease research has occurred with the work from the Livesey lab at the University of Cambridge (http://stm.sciencemag.org/content/early/2012/02/13/scitranslmed.3003771). They made use of a relatively new class of stem cells: Induced Pluripotent Stem Cells (iPS cells). How these cells are generated is pretty complicated, but is described very well by EuroStemCell (http://www.eurostemcell.org/factsheet/reprogramming-how-turn-any-cell-body-pluripotent-stem-cell). Briefly, adult cells e.g. skin cells can be converted back to an embryonic-like state, which means they can form any cell type in the human body. So, how did they use this technology?? 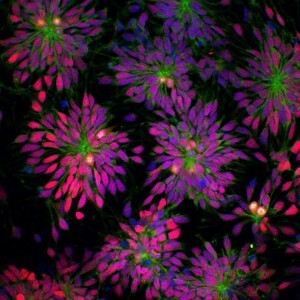 The Livesey lab pushed the iPS cells obtained from Down’s Syndrome patients to create specific brain cells. Amazingly, the brain cells generated from Down’s Syndrome patients showed signs of Alzheimer’s Disease in culture. The cells produced more amyloid beta protein, which as I mentioned earlier forms plaques in Alzheimer’s Disease. They also had problems with a protein called Tau protein, which contributes to tangle formation in brains affected by Alzheimer’s Disease. This is very interesting, but what is the real impact that this research can make? By using these brain cells from iPS cells we can increase understanding as to how Alzheimer’s Disease actually happens- they can watch the process happening in a dish, which is much easier than looking at someone’s brains. These cells could also be used for drug screens, which could help with new therapies. If they can repeat this using cells people with Late Onset Alzheimer’s Disease (which accounts for around 99% of Alzheimer’s Disease cases, that would be pretty amazing. I am a final year PhD student at the University of Cambridge and my research, in broad terms, involves epidermal stem cell biology. The epidermis, which is the outer layer of mammalian skin, is maintained by numerous stem cell populations. The elucidation of the factors involved in controlling these populations and thus epidermal maintenance is highly valuable. Not only will it provide information as to how a complex tissue is organised and controlled, the principles that are learnt can be applied to other tissues. Through the work that I am completing, I hope that I can also gain a perspective as to what goes wrong in disease processes such as skin cancer. Skin cancer is one of the most prevalent cancers in the world, and understanding what goes wrong and the factors involved could potentially lead to new ideas as to prevention and treatment. This entry was posted in Health, Neuroscience, Stem Cell Biology and tagged Alzheimer's Disease, brain cells, Down's Syndrome, induced pluripotent stem cells, iPS, Stem Cells. Bookmark the permalink.